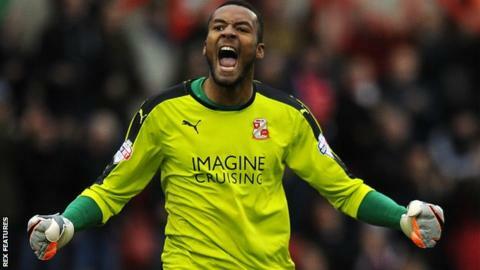 Swindon Town goalkeeper Lawrence Vigouroux says he enjoyed opting to watch Saturday's goalless draw with Coventry alongside Robins supporters. A dead leg sidelined the 22-year-old at the Ricoh Arena, with Tyrell Belford coming in for the Liverpool loanee. Vigouroux, who could return against Wigan Athletic on Friday, took it as a chance to learn a few club chants. "I enjoyed it and it was good to hear what the fans were singing about the players," Vigouroux told BBC Wiltshire. "I could not hear anything else other than Swindon fans singing. The players appreciate the support. "I was telling them that we have a very good squad here and if you stick with us then hopefully we will do you proud at the end of the season." Swindon, who appointed Luke Williams as head coach on a five-year deal earlier this month, are unbeaten in their last seven matches. Back-up goalkeeper Belford helped maintain that run, denying Coventry's Darius Henderson in injury time to ensure a goalless draw. "It was probably one of the best saves of the season - he did exceptional," added Vigouroux. "We get along quite well and I was really happy for him and he deserved a clean sheet."